Daffodils in the Spring! Yes, it seems to be trying hard to survive the changing climate. The flower is blooming well out of season. 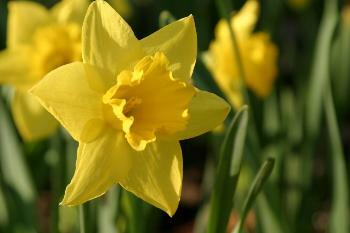 It’s great news for daffodils lovers, but not for the environmentalists and scientists. This out of season blossoming is an early warning sign climate change is playing havoc with our seasons, experts claimed. The bright golden daffs are seen near Saundersfoot, despite the fact severe frosts have hit many parts of Wales cover the past few nights. True, climate change has always happened over the earth’s entire history, with mini ice ages being recorded every few centuries. But, it is the scale and long-term nature of the current phenomenon which is making scientists increasingly concerned. One key difference between today’s warming and past climatic change was the amount of carbon dioxide in the atmosphere, Professor Charles Harris of the Department of Earth Sciences at Cardiff University said. 'Once-thought-to-be-extinct' Rare Woodpecker spotted in Florida!